If you have a website, you may have run into problems or costs you didn’t expect. Domain registrations, software updates, the site getting hacked, and other needs can add up. So, you have decided to hire an expert to handle this for you. Great idea! 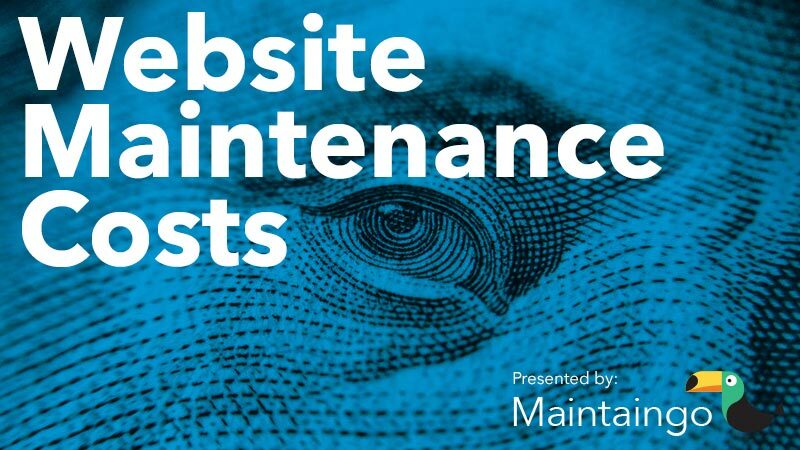 But how much should your website maintenance cost? There are many options for companies and individuals who can work on your website, and their range of pricing is wide, from $10-15 per year to thousands per month. You want your website to work well, but you also don’t want to waste your money. Picking the right option without some context is tough, so I have put together the guide below to help folks in this place. So how much? The quick answer is: it varies. The cost of maintaining a website depends heavily on what the site is designed to do, and how it was built. It’s like asking, “How much does it cost to maintain a house?” Every house, and every website, has different needs. Ultimately it comes down to time: How much time from a professional does your site need to operate well? These websites are low key, low maintenance, and low traffic. That means even the very basic hosting plans and performance will work fine for what the user needs out of this type of website. Generally, these sites have only a few pages of content, small pictures, little functionality, and few people actively viewing the website. These websites are the next step up. They usually have little functionality, but many pages of content and a large viewing audience. It is important for this type of website to have strong security to ward off malicious activity aimed at influencing the large audience that views the website. It is also important that the website host is strong enough and capable of handling the large influx of web traffic that can come from a viral blog or a highly shared article. These websites are generally for a small to medium sized business to have a domain and direct customers to their basic website. These websites are usually not built for performance and may have little content and functionality. Typically these websites are only used so a business can say they have a website, but do not actively utilize it online or run a small Pay-Per-Click campaign. These websites are the next step up from a basic business website. With the included e-commerce functionality, there is consistent updating of product and reviewing orders, however they are generally not performance built or optimized. These websites are for businesses that do some e-commerce sales, but not a high volume and would not support a large increase in traffic. These websites are for businesses that do a large amount of online sales. With a customized platform, the design and performance of the website is specifically optimized for visitor engagement and interaction. They usually have a top-tier website host and advanced website security, including a https (secure) domain to keep malicious activity away and secure transactions. These websites are custom built for their specific purpose and optimized for their target audience. Custom-built websites can vary from large research websites with custom search features, to optimized e-commerce websites with optional extras, to even custom feature websites like a mainstream review or rating website. They are built for large audiences, have a vast amount of content to display, top notch security, and typically require a dedicated team of developers. Ultimately, it’s about finding the right person or team for your website’s needs. Freelancers from UpWork or Craigslist are options, typically at the low-end. High-end work (e-commerce in particular) is usually served best by dedicated web agencies, including Maintaingo’s parent company New Theory. For low to mid-level maintenance, Maintaingo offers solid pricing and expertise. Take a look at our pricing for more details, or call our office at 206-429-6060. Here at Maintaingo, our experts are ready to help address any and all WordPress fixes or maintenance you may need. We are proud of our hard work and affordable plans that help customers run their website at its best. 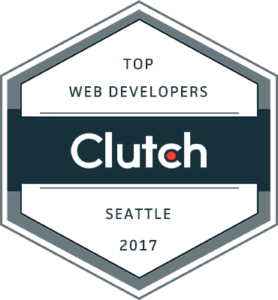 This is why we are pleased to announce that Maintaingo has been ranked as one of the top 10 web developers in Seattle by Clutch! Clutch, a B2B ratings and reviews platform, connects potential IT service buyers with the firms that fit their needs. They produce content surrounding a variety of services and they use a unique methodology to determine the top performing firms. Client references form the backbone of this methodology and offer third party verified examples of a company’s work. Thank you to Clutch for including us in their research and to our clients for providing candid comments! We are excited for our future projects and to hear more great feedback from our clients. 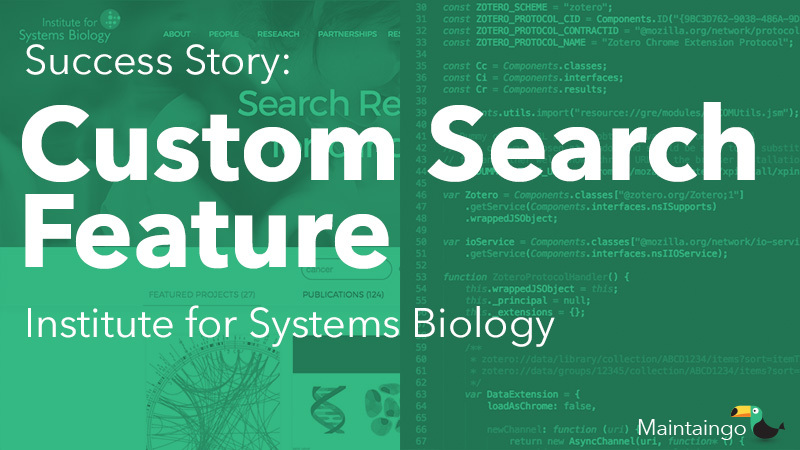 The Institute for Systems Biology (ISB), a leader in scientific research, generates hundreds of pieces of content each year. Key to their mission is sharing this large database of articles, publications, news, and projects. However, finding this content was hampered by an unsatisfactory search tool. A visitor seeking a specific project or publication was often met with an incomplete and cluttered page and many irrelevant results. Worse still, ISB’s extensive collection of research publications was stored on a separate database not included in that search, frustrating the researchers who wanted to share their work more easily. As a Maintaingo client, ISB asked the team to design and develop an improved search experience that integrated their full dataset into a single, useful results page. Maintaingo worked with ISB’s internal team to establish the project requirements. This new tool needed to be robust and fast enough to handle thousands of visitors per month. Different user types (from researchers to press outlets) needed to find their content in a minimum of clicks. And it the results needed to be relevant to visitors “automatically”, with a minimum of outside guidance or pruning by ISB staff. Maintaingo began with the design of mockups for the potential new results page. A “tabbed” layout was introduced. Iterative rounds of designs were created in collaboration with ISB’s internal communications team. Once the user experience and aesthetics were matched expectations, Maintaingo moved to development of the new feature. Like many research institutions, ISB uses Zotero for tracking and sharing their publications. A custom integration was developed by Maintaingo to pull the data from Zotero’s service into the WordPress-powered website. Presentation was helped by the flexible WordPress “custom post type”, and relevance fine-tuned with the powerful Relevanssi search plugin. After extensive testing across browsers and devices, Maintaingo took the updated search tool live. In the weeks that followed, ISB saw a significant increase of user engagement via their new search results page. Visitors were less likely to “bounce” away from the results page, and spent additional time browsing the website. The new inclusion of research from Zotero in the results page lead to markedly increase of traffic that viewed that research page loads and visitor sessions generated by the search tool. 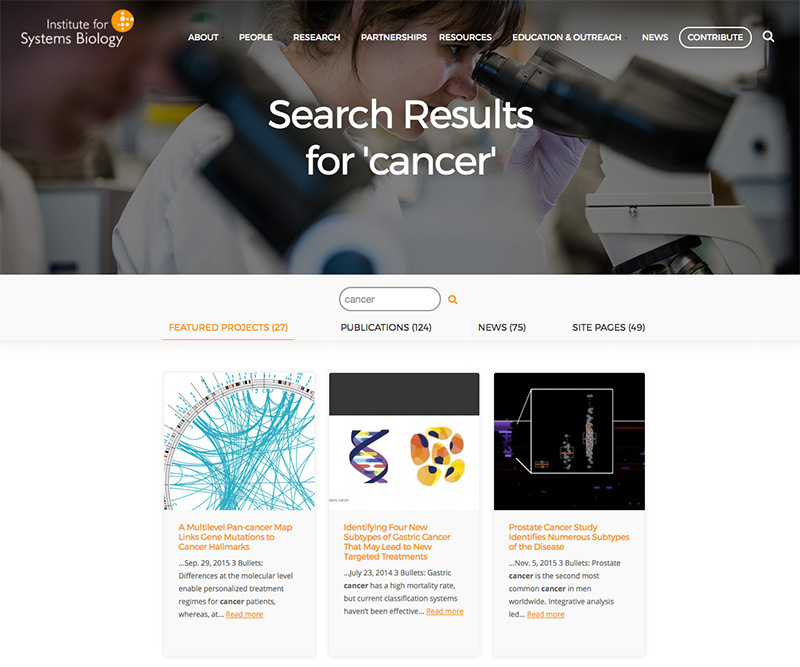 Please visit systemsbiology.org to see the search feature in action.